A new inreoduction to our range. A kaleidoscope of changing colour in autumn. Forms a desirable Japanese-style tiered tree. An exquisite Japanese Maple with vibrant golden-yellow foliage, new to our range of Acers for 2018! 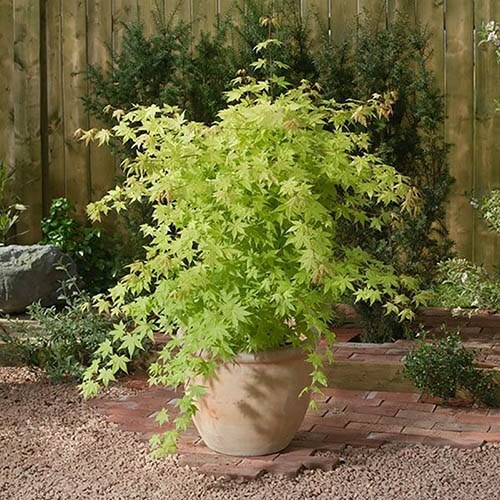 Acer Palmatum 'Summer Gold' is a superb addition to your garden, with tiered layers of bright leaves which emerge salmon-pink before maturing to an eye-catching display of gold and lime green. This particular variety has shown to be a good grower in areas where other yellow acers have failed to grow, making this a super all-round maple, ideal for beginner gardeners, and proven to be successful! As with other Japanese Maples, in autumn, Summer Gold puts on an exceptional display of colour, with the leaves gradually turning a beautiful shade of coral before transitioning through salmon-pink, scarlet and finally deep red. The transition is so amazing that you'll want to photograph it every day to keep a record of the superb colour changes. Grow your Japanese Maple in full sun or partial shade for best colour and keep it well watered to prevent leaf scorch.